Visit My Wedding Favors online at MyWeddingFavors.com which strives to help every bride and groom prepare for their special day. My Wedding Favors believes that the little things - a favor, a gesture, a simple thought put into action - speak volumes in all the special occasions of your life. My Wedding Favors vast selection includes ideas to please and amaze every design sense and wedding vision, from theme wedding to destination reception favors, from favors that feature the elegance of Asia to the romance of the four seasons to the carefree whimsy of the beach - you'll find it all on MyWeddingFavors.com. Save some extra money with My Wedding Favors discounts, My Wedding Favors coupons, My Wedding Favors promotions and My Wedding Favors savings from 58Coupons.com. Act now and take advantage of a $25 discount on orders over $200 from MyWeddingFavors.com. For a limited time offering complimentary UPS shipping on all orders over $149 that are shipped to US States. See site for details. Use this coupon code on MyWeddingFavors.com to save 10% on orders over $150. For a limited time only, you can save 15% off your order of $75 or more from MyWeddingFavors.com with this coupon code. 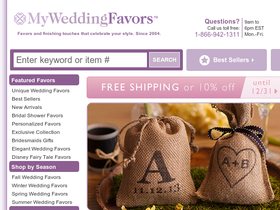 Enjoy 5% off your entire order from MyWeddingFavors.com when you use this coupon code at checkout. MyWeddingFavors.com is now offering a $5 discount on your orders of $50 or more with this coupon code. Don't miss out on the wedding favors in the Clearance section on MyWeddingFavors.com where you can save up to 75%.